The Bengali community is known for their rich culture and literature. That's why when they celebrate their most awaited festival Durga Pooja, they celebrate with so much zeal and enthusiasm. Through this festival, they try to unite the community members from all walks of life for sharing their love and affection through their dance, music and cuisine. Durga Pooja is a community festival where communities come in groups and pray together in beautifully decorated pooja mandals. In Kolkata, preparations go in full swing at least three months in advance. The traditional craftsmen, passed from generation to generation sculpt the idols of Goddess Durga out of clay in a small town called Kumartali. Durga Pooja is rejoiced to hail the annual homecoming of Goddess Durga along with her four children Ganesha, Lakshmi, Kartik and Saraswati. She arrives during the autumnal month of Ashwin (September-October) for only four days. Thereafter, she starts her journey back to her mountainous kingdom-Kailash. 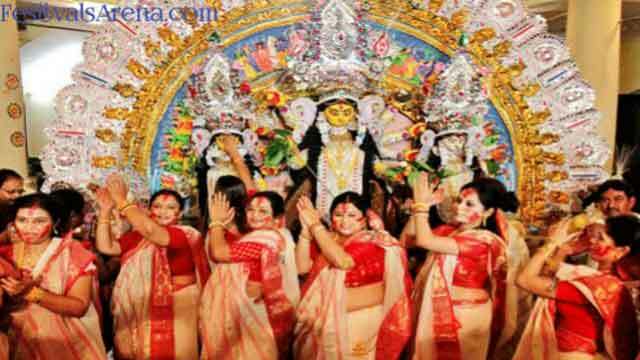 The Bengalis begins their preparations seven days earlier to usher in the aura of Durga Pooja. This auspicious occasion is called as Mahalaya, where the artisans give the final touches to the idol by drawing the eyes. Debipaksha is an auspicious occasion for the Bengalis. They depict the image of Devi Durga as "Dashapraharana-dharini", meaning that each of her hands carrying ten different weapons gifted by other gods to kill the demon--Mahishasura. On this day Goddess Durga arrives, accompanied by her children. She is welcomed with much joy amidst the beats of dhak a traditional beating of the Indian drums. On this day, the face of the idol is unveiled during a pooja called 'bodhan'. On this day, women observe the Durga Pooja fast for whole day for the prosperity of the family. The Durga Pooja festival is broken in the evening with fruits and luchis (a kind of bread made of flour), usually eaten with sabzi (vegetables). It is the first day of Durga pooja. 'Kola Bow' or 'Nabapatrika' is given an early dawn bath. This is an antiquated custom of worshiping nine kinds of plants. They are as one worshiped as a symbol of the goddess. The day starts with a presentation of Sanskrit songs in community pooja pandals. The priest breathes life into the idol of Durga as he performs the sandhi pooja to the chanting of shlokas. All these special ceremonies are interspersed with the usual rounds of anjali, prasad and bhog. Here, Durga is worshipped in her Chamunda form, where they killed Chando and Mundo the two generals of Mahaisasura. This day is important as it celebrates the victory over demon Mahishasur. Here the devotees recite the mantras and offer flowers to Devi Durga (pushpanjali) and pray for her blessings. On this day, the Navami bhog a typical Bengali vegetarian meal, is offered to Goddess Durga. 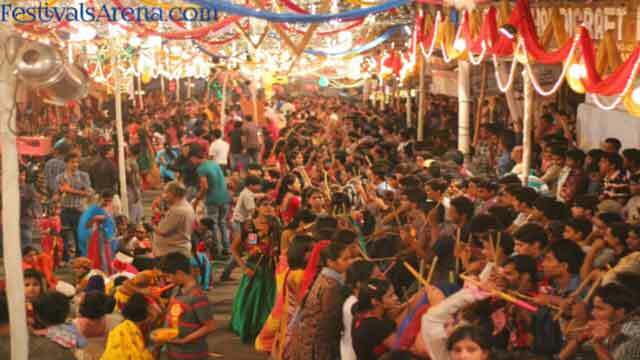 Thereafter, it is feast time where devotees sit together and relish all kinds of vegetarian Bengali dishes and sweets. Dashami is the day when Goddess Durga departs her journey back to Kailash, her husband's abode. With a heavy heart the Bengalis immerse the clay idol of Durga in the sacred waters and bid her good bye earnestly waiting to see her again the next year.